After I got so much good feedback from my festive rocky road recipe, I thought I'd show you all another treat that's absolutely delicious yet super easy and quick to make. I actually used Wish Wish Wish's recipe for the mug cake half of this recipe, and then put my own little twist on it, so all credit goes to Carrie for the actual cake! Put your butter in the mug and melt it, then add the water. I found it was easiest to add the wet ingredients first and then add in the dry ingredients. Add in your flour, sugar and cocoa powder, and give it all a big stir! 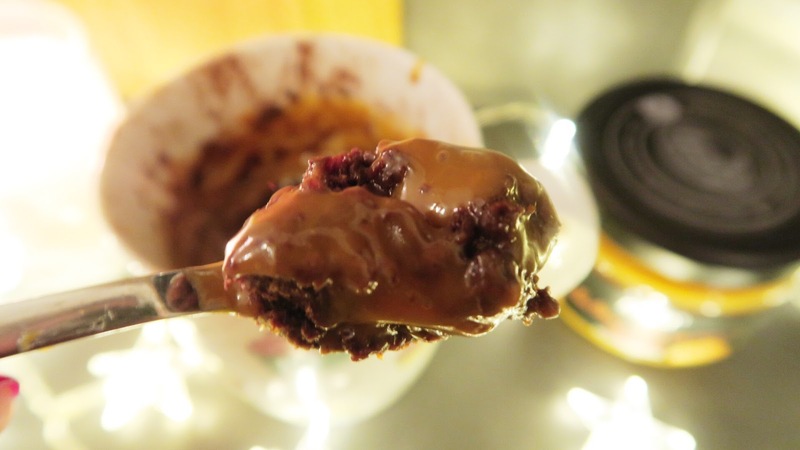 Make a dip in your mug cake, pushing the mixture to the sides of the mug and creating a dip in the middle. Add your salted caramel. I found 2 tbsp was just the right amount. Pop in the microwave for 1 minute 30 seconds - 2 minutes. This will depend on the power of your microwave but 1 minute 30 seconds worked well for me. 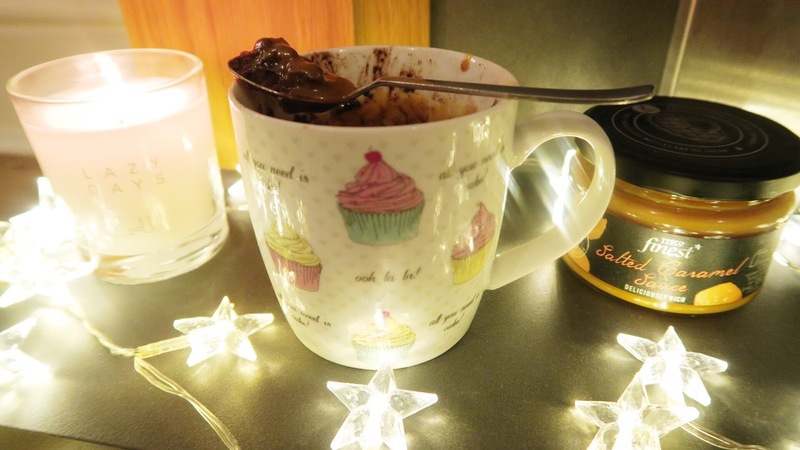 And it really is that simple and quick to make a super chocolatey mug cake with a salted caramel twist. Your salted caramel should go over the top of the cake as well as in the dip, meaning you get a coating on every spoonful, yum! 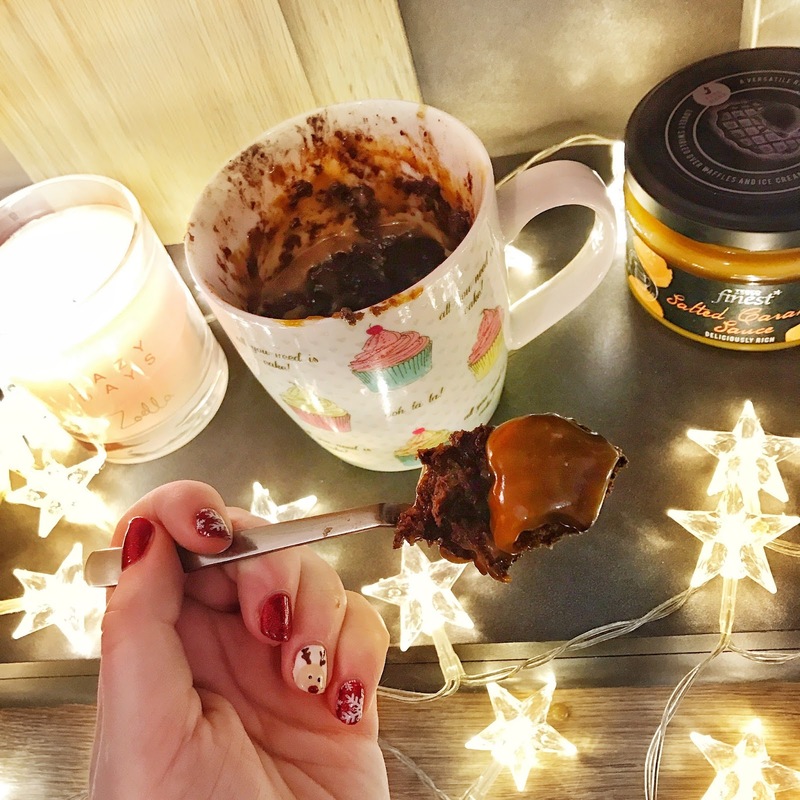 Let me know if you decide to try this mug cake out for yourselves, it's Christmas so you have an excuse to have a chocolatey treat!